Dressed to Kilt – Texas Style! You may remember last year we published a few posts on the Edinburgh Castle tweed. Launched last August, it was designed and created on restored looms at Knockando Woolmill in the Spey Valley. The mill operates traditionally, with heritage at its core. As well as using traditional machines and techniques, Knockando are committed to training new craftspeople – which they’re able to do thanks to support from Historic Environment Scotland. Fast forward to January 2018. We were approached by Dr Geoffrey Scott Carroll, who has been responsible for the last 10 years for the world famous Dressed to Kilt fashion show. This has played a part in New York’s Tartan Week festivities. 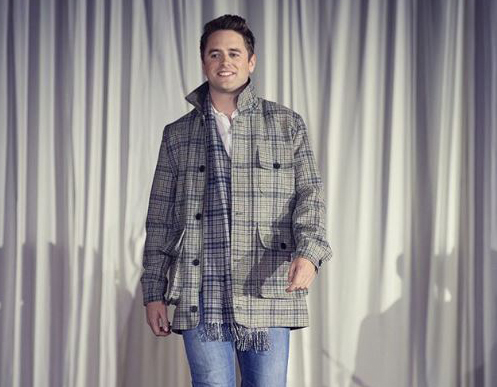 Geoffrey heard across the pond about the castle tweed, and thought it would be a perfect addition to the prestigious catwalk show. The Dressed to Kilt show this year was hitting the road and made Houston, Texas its home. Did you know Houston is home to the USA’s largest ex-pat Scottish community? This is due to links with the oil and gas industry, a little known fact! The organisers felt it was the perfect year to take the show to the city, especially following the devastation of Hurricane Harvey in November 2017. Our Head of Retail, Natasha Troitino, jumped at the chance. We commissioned Borders outfitter, Richard Mackay to create the first Edinburgh Castle tweed hunting jacket. It was to be modelled by 25 year old Viscount William Garnock – now a resident of Texas, but he considers Fife his home. You can buy the jacket from our website, made to measure. The fashion show was held on an unseasonably cool evening at Hobby Airport, in the Million Air hanger. That day (7 April) the temperature dropped by 40F, making the Scottish delegations feel rather at home! The great and the good of Houston attended, with catwalk contributions from Calzeat, House of Bruar, Totty Rocks, Walker Slater and Slanj amongst others. We were delighted to present local businessman and philanthropist Jim McIngvale with an Edinburgh Castle scarf. Known locally as ‘Mattress Mack’ due to his multi-store business selling beds and bedroom furniture, ‘Mack’ selflessly threw open his doors to Houston residents who lost their homes due to the hurricane. He housed thousands of people, organising clothing and food amongst many other charitable activities. The catwalk show was also held to raise money for the Navy Seals and Lone Survivor Foundations in the US. Navy veterans took the catwalk, after taking some coercing to don the tartan! 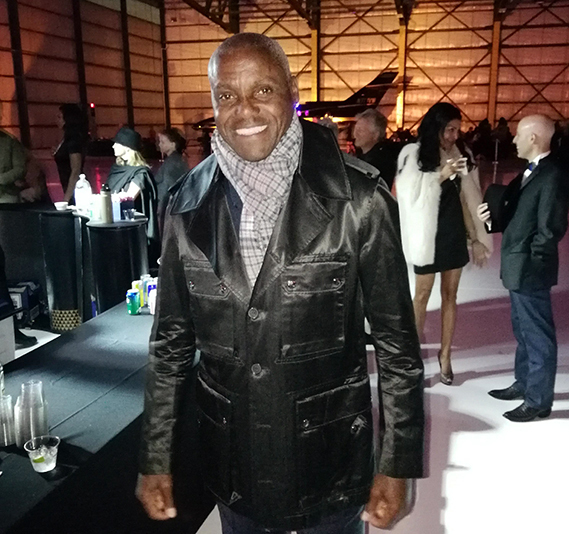 Olympic athlete Carl Lewis (who now coaches schools athletics in Houston) was delighted to receive a tweed scarf when departing the catwalk, especially given the unusually cool temperature! We thought he wore it well! Olympic gold medallist Eve Muirhead also took a turn on the catwalk and we look forward to seeing her donning the scarf on the curling rink soon. All in all, quite the experience for the Edinburgh Castle tweed team. It was wonderful to get such great feedback on our unique tweed products, as well as well as experience all that Houston has to offer. We look forward to working with new contacts to tell our tweed story and would love to see your pictures of our tweed around the world!